The residents of Londonderry were shocked after an explosion took place in the city centre on Saturday night. This happened after the police were alerted of a vehicle which was hijacked by three masked men around 11:30 PM. It is believed that the men threw an object in the back of it before abandoning it. Houses have been evacuated and several cordons have been put. The affected people are being accommodated in the community centre in Central Drive. 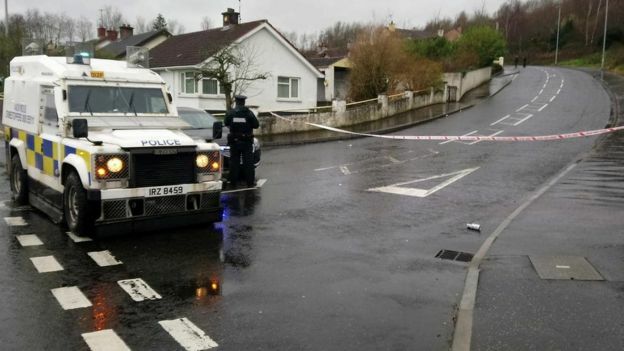 The new IRA, a dissident republican group is believed to be responsible for the attack. On Monday, a fifth man was arrested in connection with the bombing. The same man has related to an armed robbery which took place last Tuesday. The other four men arrested in this case are aged, 42, 32 and the two in their 20s. The vehicle belonged to a pizza delivery man. The hijackers put a gun to his head and later used it in the bombing. The CCTV video of the attack has been posted on Twitter. A group of people can be seen walking past the vehicle shortly before the blast happened. The courthouse has been closed and the cases listed to be heard are being held in Strabane and Coleraine. The pizza delivery person has the sympathy of all residents. He was threatened and intimidated. Thankfully nobody was injured in this mishap. This is a peculiar case of an attack in a town which has around a hundred thousand residents. The Irish Republican Army is paramilitary movements in the 20th century dedicated to Irish Republicanism. The New IRA was formed as a merger between the Real IRA and other republican groups in 2012. They believe that all of Ireland should be free from British rule and free to form their own government. The New IRA was formed in 2012 after several dissident republican organizations said they were unifying under one leadership. It is believed to be the largest dissident republican organization. The group is believed to have been responsible for several attacks since its formation, including the murders of prison officers David Black and Adrian Ismay. Masked men have carjacked a vehicle belonging to a pizza delivery man, in this peaceful city. 5 men have been arrested in this case. The investigative agencies will be interested in understanding the structure of the New IRA and the position of the arrested men in the hierarchy of the New IRA. The challenge is that conventional interrogative methods are not enough to extract this information from the arrested men without the use of ruthless means. There are several witnesses in the case, but to interrogate them verbally is not effective as their memory may be clouded because of trauma and shock. What investigative agencies need is the ability to tap into the mind of the suspect and the witness and accurately extract the knowledge they possess. The brain does not lie, but until today, there was no way to tap into it in a cost-effective and reliable manner. The residents of Londonderry and the citizens of Northern Ireland seek an answer. They seek closure on this traumatic attack which could have maimed or resulted in the death of innocent citizens. If the authorities in charge of this investigation use conventional and age-old techniques then the ones directly responsible might get punished, at best. However, it would be extremely beneficial to law enforcement if the intelligence gathering method is able to elicit important intel about the organization to which the suspects belong. Brainwave Science has come up with the scientific way to solve this conundrum. This technology called, iCognative is a non-invasive way to gather intelligence and to screen suspects. The beautiful aspect about the test is that it lasts around 45 minutes, and the results are declared immediately, because of the super-fast nature of the software technology. The intelligence agencies of today have never seen an intelligence gathering tool which is extremely efficient, easy to master, easy to learn, /accurate and reliable in its results as iCognative. iCognative is the ultimate suspect screening tool which is available in the market. The way iCognative works is that a suspect is made to undergo this test under the supervision of a test administrator. Pictures, words and phrases(stimuli) which describe the crime scene and reference the associated persons, are shown to the test-subject on a computer screen. The test-subject is exposed to the stimuli and his or her brain responses are recorded by a headset. The brainwave response to several of these inputs or stimuli is recorded and analyzed by a iCognative software system running on a connected computer. Once the test has ended, the iCognative software system analyses the responses of the brain in comparison to the inputs and determines with 99.9% accuracy, if the subject possesses crime-related information or not. The stimuli in the case of the Londonderry bombings can be pictorial and verbal details related to the three masked men who threatened and carjacked the pizza delivery man, details of the armed robbery which took place on Tuesday, CCTV footage of the masked men before, during and after they committed the carjacking. iCognative must be administered on all the 5 arrested men. The stimuli related to the other armed robbery incident of Tuesday (believed to be committed by the 5th arrested person) can also be used in this test. Torture or coercion is absent during the iCognative test. Moreover, there is no known way of fooling the iCognative test. It does not reveal any false positives or false negatives. iCognative is a revolutionary intelligence gathering mechanism which is applicable to multiple disciplines like, national security, counter-terrorism, human and drug trafficking, immigration, law enforcement, border control. iCognative is the only way to solve cases in a speedy yet accurate and fool-proof manner. Believe it or not, while only 1-2% of all cases are relevant for investigation through DNA or Fingerprinting, iCognative is applicable to 85-90% of all cases, be it civil or criminal. The counterterrorism agencies and the Police Service of Northern Ireland must try the iCognative technology, developed and marketed by Brainwave Science in order to appreciate its scientific approach towards solving a crime.